We restore pools marred with unsightly rebar rust spots, cracks and many other pool surface issues in just hours - not days - all underwater! Swimming pools are a common outdoor living feature in Arizona. While it’s great to spend a scorching afternoon in your very own pool, the thought of swimming pool repair gives many homeowners pause. Draining a pool in order to perform leak repairs or cracked swimming pool repair can be a big hassle, and it can cause further damage, besides. 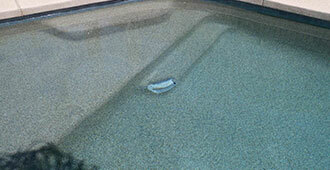 At Underwater Operations, we specialize in performing underwater pool repair. No draining needed! Because Underwater Operations values you as a client, we would appreciate your feedback by leaving a rating on our Google+ page. Don’t Put Off Necessary Pool Repairs Any Longer! If you have been putting off your pool repair because you haven’t wanted to have your pool drained, Underwater Operations can help. 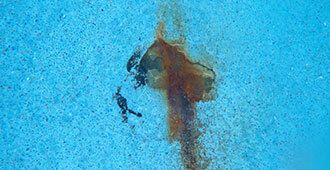 Neglecting to have rebar rust stain removal or other cosmetic work done makes your pool look less-than-appealing. Putting off bigger fix-up jobs, like leaky swimming pool repair, can just make the problem get worse over time. This can cost you more money and more time when you do finally have the problem fixed. Do yourself a favor and have us come out to take care of it now. Is your pool cracked? 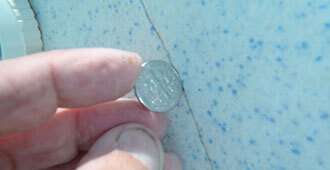 Over time, cracking can occur on the floor and wall of your pool. At Underwater Operations, we have the tools and supplies needed to perform crack repairs without draining your pool! 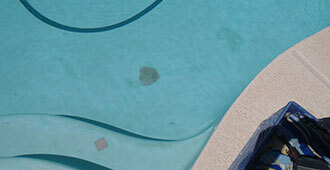 If you suspect that your pool is leaking, a dye test can let us know where the leak is coming from. Even better, we can go ahead and fix that leak without letting the water out of your pool. Are there ugly stains on your concrete? 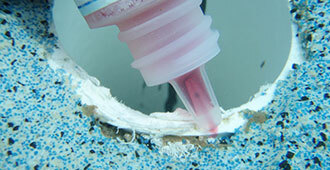 Chances are good it’s coming from the reinforcement bar under the surface of your pool. Your Underwater Operations pool professional can fix it. No pool drainage needed! 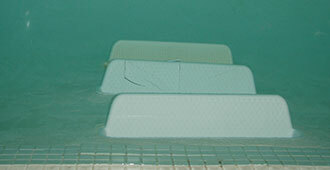 Over time, you may experience cracks and breaks in your plastic or fiberglass pool steps. Draining the pool to fix them isn’t necessary; at Underwater Operations, we’re not afraid to get wet! 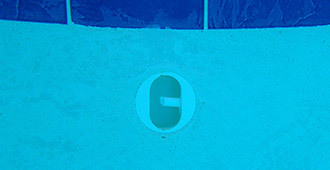 Calcium can leach out from your cement pool, leading to white lumps on the inner surface of the wall. Called calcium nodules, these ugly little bumps can be removed by the underwater pool repair experts at Underwater Operations. If your pop-up cleaning nozzles are malfunctioning or simply not working, you’ll notice it by the grime in your pool. We can get you back to where you should be with our pop-up extraction and replacement services. PebbleTec is a popular option for pools in Arizona. If you’re missing a large stone, we can repair that for you without having to let the water out of your pool, which potentially causes further problems. 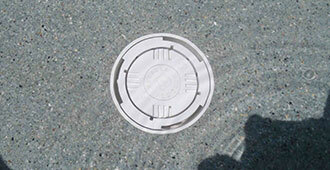 Don’t let a broken drain cover become a safety hazard for all who use your pool! We can replace yours without letting the water out or otherwise impacting your pool’s usage. At Underwater Operations, we’ve got you covered. 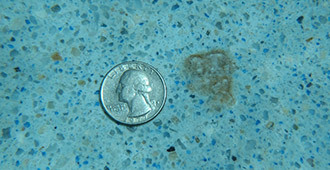 If you’ve had your pool drained before for a repair, you might end up with pops and bubbles in the sidewalls or floor. We can fix this delaminated surfaces without causing further damage. Swimming pool rope and cup anchors can give you a big headache when they come loose or pop out of place! Let us help you by getting them replaced without the hassle of draining your pool. No matter what type of non-plumbing repair you need, our pool experts can handle it. We specialize in fixing cracks, pebble repairs, delaminated pool surface repair and rebar stain removal. We can also perform dye testing to find out exactly where the problem is and how extensive it might be. Give us a call today to find out more about our services.